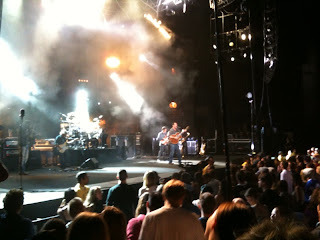 there is no such thing as a bad dmb show, but they seemed a little flat last nite. maybe it's to do with dave's problems with his voice. he honestly didn't sound too bad, just had some troubles with the higher notes, which is not unusual towards the end of the summer anyway. i think the album was a little ambitious with his range and overestimated dave's ability to consistently reproduce that range night after night on the tour. it also seemed like boyd wasn't feeling too well, he kept his hoodie up the whole night and seemed a little low energy. i really miss 'roi. jeff coffin is a great sax player, but it sounds like he's been imposing a little more of his personality to the songs and his playing style is a little too punchy and bombastic for some of the stuff that 'roi used to play. 'roi had such a soft, soulful touch. this was the pot smokingist crowd i've ever seen (smelled) at a dmb show...and that's saying something. seriously, it was like being in the inside of a bong. 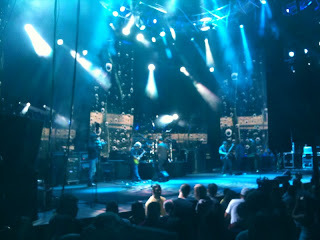 we were way far back in section b (about dead center, though) and the crowd is definitely different back there. lots of people coming in and out of their seats and talking the whole damned time. very distracting. Stay Or Leave * - first time i've seen this with the full band. it's a heartbreaking song but i love it. Lying In the Hands of God *+ -oh. my. god. sublime. the song with just the guys was great on its own and then nestor torres' flute jam (that sounds weird to say) took this into a whole other realm. Why I Am * - loved it. great energy. happy to celebrate 'roi. Crush * - the crowd loves singing this one. the sax-guitar battle was fairly intense. Funny The Way It Is * - can i admit i don't really love this song? Squirm * - downright rad. great song. great lyrics. great intensity from dave. don't think this will be a fan favorite, judging from all the chatting that was going on around me. Where Are You Going * - to get another beer. Alligator Pie * - love this song about new orleans. Dancing Nancies * - what can i say about nancies? always love it - after hearing this song live for the first time, i knew i was hooked, so it's very nostalgic. So Damn Lucky * - i don't love the album version of this, but it's great live. have a feeling they throw more of dave's solo stuff in for timmy. You and Me * - a sweet song. you could hear all the girls (including me) go "awww" at the opening notes. i think this could be big whiskey's crash. Grey Street * - always love this and it was great. Jimi Thing * - always a great way to end a set. disappointed dave didn't let the crowd sing the first verse by ourselves. Baby Blue ~ - dave by himself. when i saw the little guitar, i knew he was going to play it. it is such a sad song, i usually skip it on the album, but amazing to see him sing it live. he flubbed the lyrics at the beginning, but that's why we love him. The Maker * - probably the best version of this song i've heard from them yet. Tripping Billies * - was really glad to hear this since i had been humming the opening lines all day. always a great way to end a show. so, #28 tonite. here's hopin' for best of what's around, two step and/or #41! love you guys no matter what! 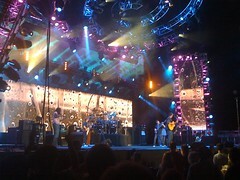 dmb week starts in about 9 hours. can't wait, can't wait, can't wait!